As it may be quite obvious from the name, a cupcake order form is used to take an order for cupcakes from a customer. 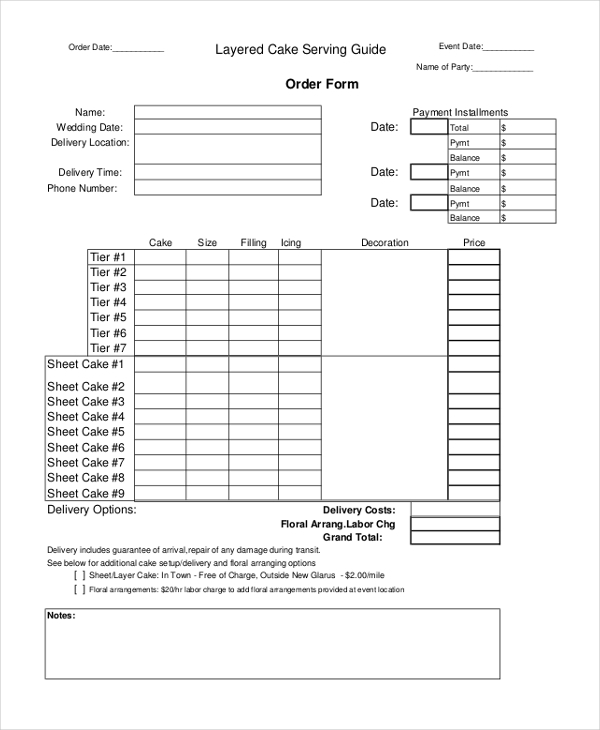 This form is usually used by bakers and cupcake vendors for taking a bulk order. The form comprises a list of various flavors of cakes on offer and the frostings available which make it easier for the customers to place an order. The person may also have to provide additional details like name, address, date of delivery etc. You May also see Purchase Order Forms. 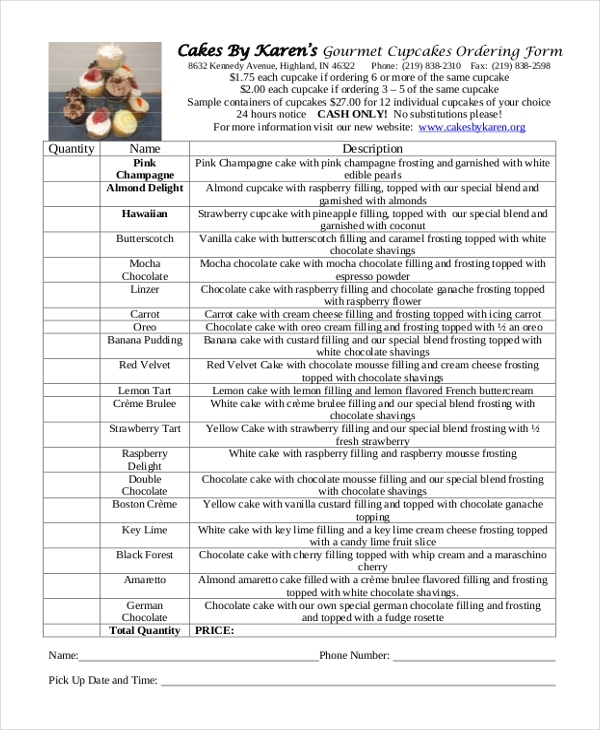 This form is used by a vendor to get an order from a customer for cupcakes to be supplied for a special event. The customer needs to fill in details like types of cupcakes, frostings, fillings etc., along with personal details and date of the event. 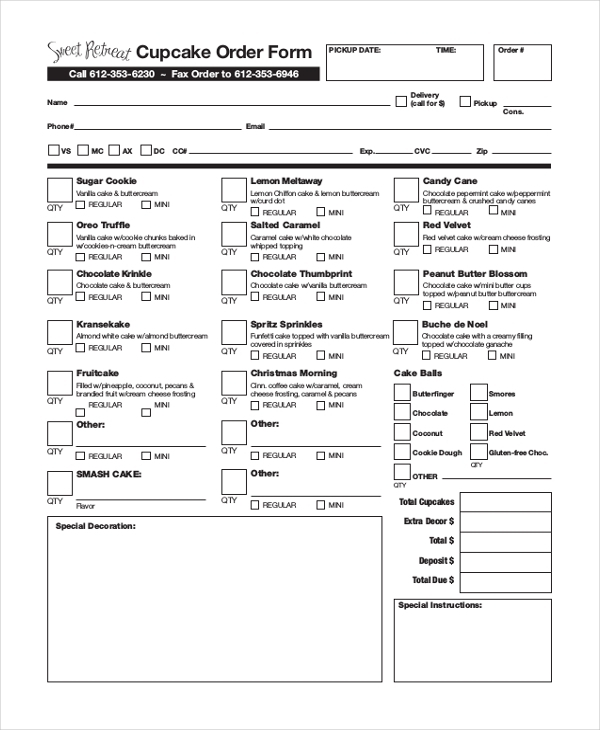 This form is generally used by home chefs who may be offering gourmet cakes. The form comprises the details of the cakes they have on offer and the customer just needs to select his choice of cake and fill in the quantity required. Whenever a bakery agrees to supply cupcakes for an event, then it uses this form to enter into an agreement with the party. The customer is required to make his choice of cakes and fill in all the required details. 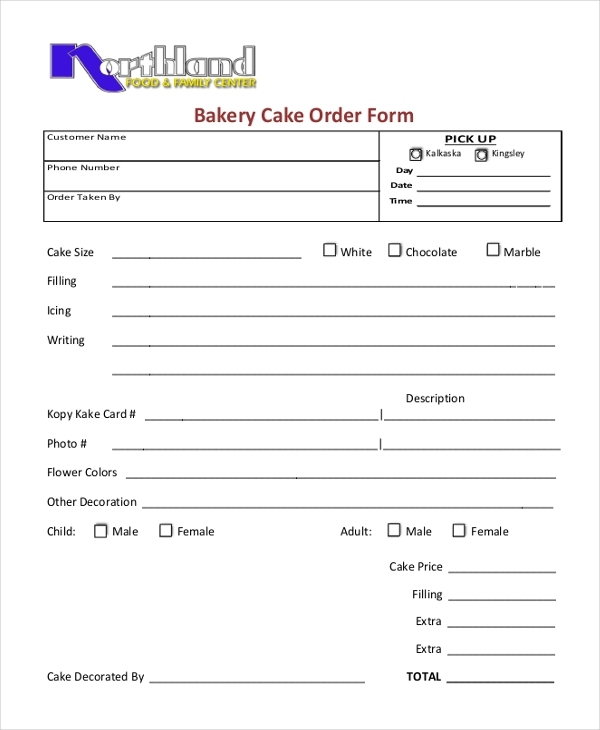 As the name indicates, this form is used by a bakery to make the cake ordering process an easier task for its customers as well as itself. The form contains details of the cakes and frostings available which makes for a convenient order placing. This form is usually used by a baker to get down the details of a wedding cake that a party needs to place. The form contains all the options for a possible wedding cake which makes it easier for the party to make a choice and place the order. This form is mainly used by a bakery or vendor who may have been approached by a customer to create a custom made cake. Using this form, the baker can get a clear idea of what the customer expects of him. 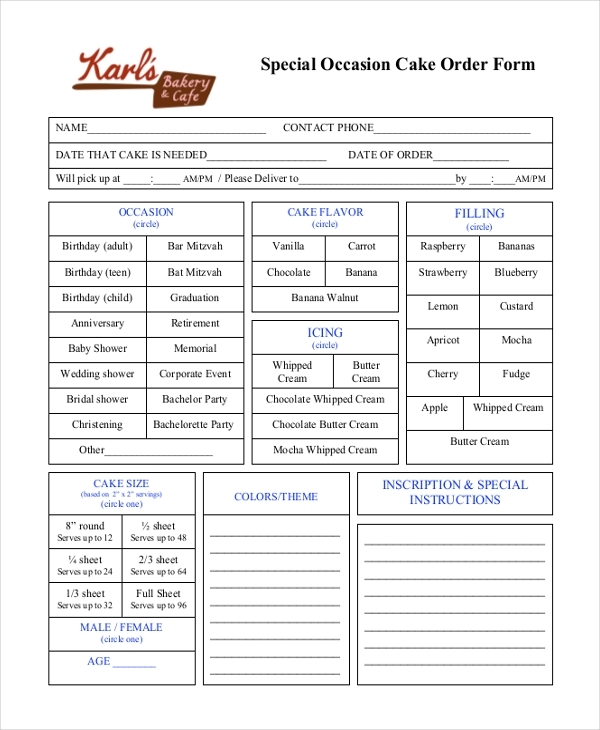 This form is used by a bakery to get an order for cakes for special occasions. The form contains details like occasion, flavor, frosting etc., which makes it easier for the customer to place an order. This form is mainly used by bakery shops to enable their customers to place an order for the various products that they have on offer. With the details of the products listed in the form, the ordering process is simplified. 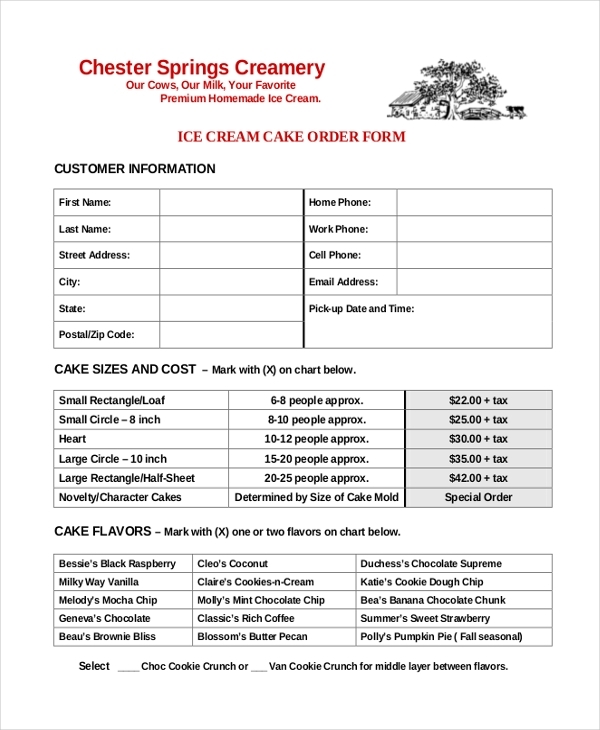 As the name suggests, this form is used by a bakery to enable its customers to conveniently place an order for its ice cream cakes. The form contains the details of the cakes and the customers can easily make a choice. 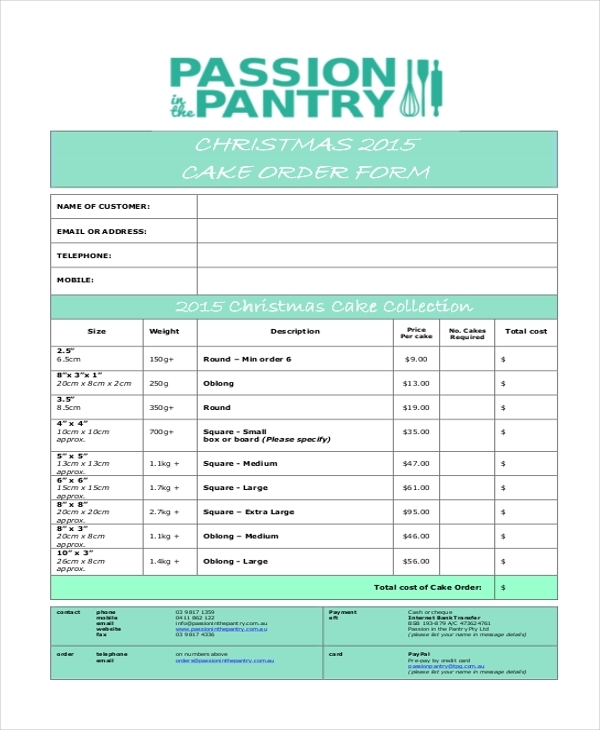 A baker generally uses this form to help his customers place an order for Christmas cakes. The form lists the details of the cakes that the bakery has to offer and thus makes it easier for the customer to choose the best Christmas cake. Who Should Use a Cupcake Order Form? A cupcake order form simplifies the order placing process and helps in avoiding any sort of confusion. Thus, this form should be used by any person or shop specializing in baking and marketing their cupcakes. Whether the baker operates from a shop or a home, the cake can help him or her to get bulk orders from customers in an organized manner which would make his/her work easier. Useful Change Order Request Forms. 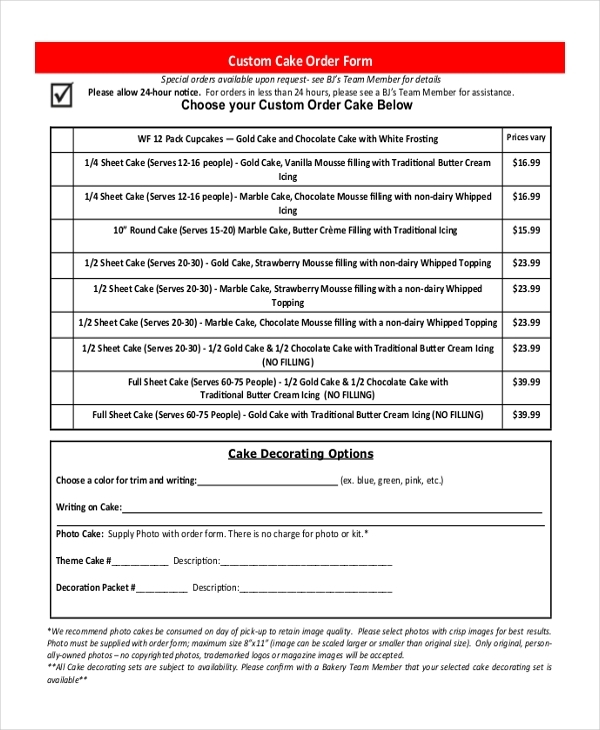 Why Should One Use a Cupcake Order Form? Since a baker may have a number of cupcake flavors and frostings to offer, he may often find it difficult to spell out these in detail. The customers may also find it difficult to make proper choices when given the details orally. However, if a cupcake form is used, the baker can list down all the flavors, frostings and fillings which would make it easier for the customer to place an order conveniently. The form also makes it easier to keep track of the event dates and quantities, thus helping to avoid any confusion. What Important Segments should be Included in Cupcake Order Form? 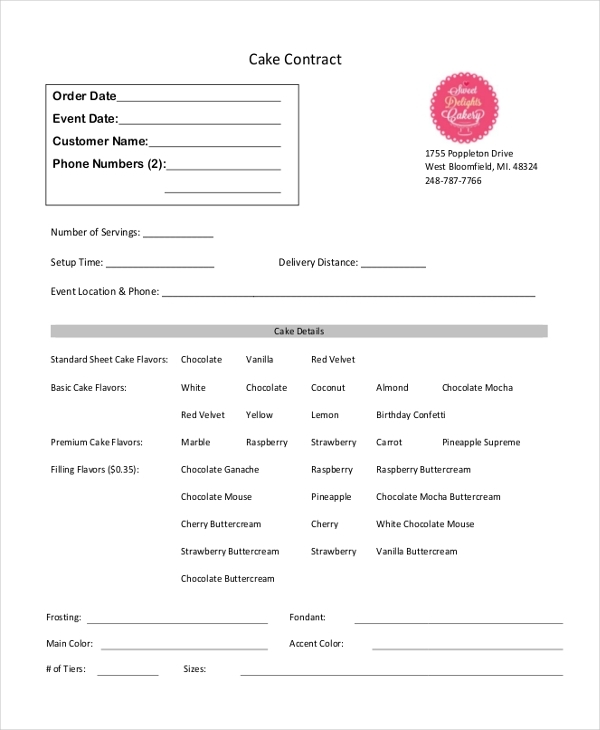 A cupcake order form should contain a segment where the customer can fill in his personal details like name, contact information, details of the event for which order is being placed etc. This should be followed by the types of cupcakes, flavors, and frostings on offer. Putting these as check boxes would be advisable as this would simplify the order placing process. You can also see Construction Change Order Forms. 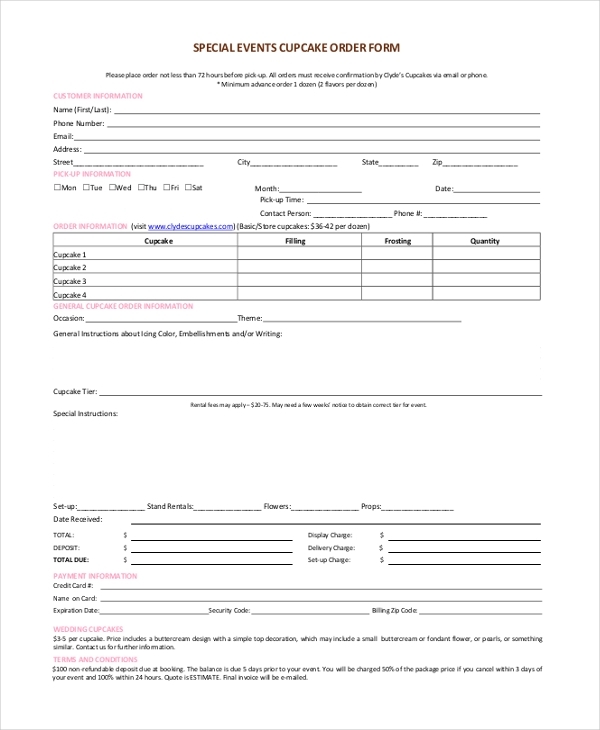 A cupcake order form can surely make your work life easier and organized. These forms are readily available on-line and finding the one perfect for you would definitely not be hard. These can be easily downloaded and customized to personalize them.